He had to have something good to offer them. Now we know it was kushner. You missed the 12 pages of the typical Trumpeters deflecting, misdirecting, Hillarying, fake news-ing, and Obama'ing. I even think there was some muslim brotherhood BS in there somewhere. I imagine that would depend on just what they were talking about?? would break some law somewhere??? What law or laws did Kushner break? No more so than what I replied to. Clearly he directed Flynn to contact Russia to collude to help Trump win an election that took place in November ... in December! You know how dumb these Republicans are! sheesh! As part of the transition team the Logan act does not apply. It is not illegal to speak to the Russians or meet with them over foreign policy issues. You just make stuff up. Its wild. 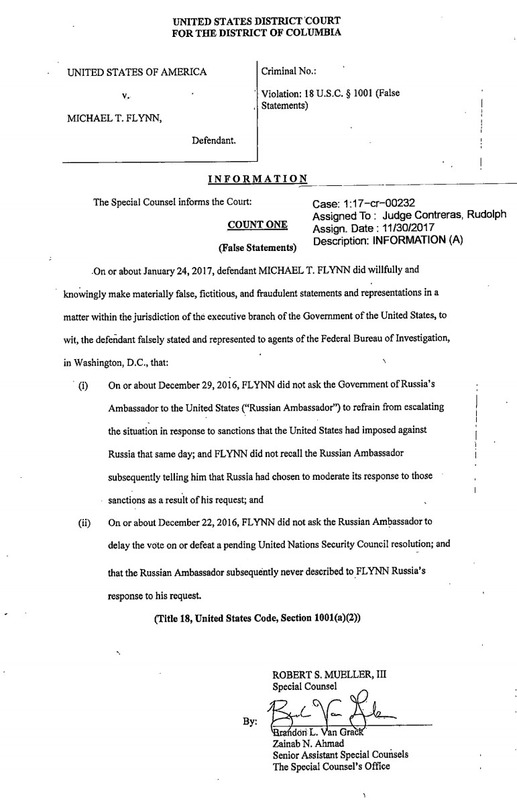 Have you figured out Flynn was not indicted but rather charged yet? And yes, it is Illegal for a transition team to conduct foreign policy when they are not in office. Asking the Russians to delay a UN vote or assuring them that Sanctions would be reversed and telling them not to react is absolutely conducting foreign policy and undermining the United States Government. That's based on a law from 1799. Only twice in 218 years has anyone ever tried to enforce it, and both times they failed. It would be the ultimate Hail Mary pass if Mueller tried to indict anyone on it. Considering the law violates the 1st and 5th amendments its no wonder its not used. So does the FARA act, now that you mention it. I suspect that it would be declared unconstitutional if someone stood their ground and fought it in court. The FARA act is different as it requires the person in question to notify the Federal government that they are acting on behalf of and in the interest of another foreign government inside the United States. Far different than telling a US citizen they cant speak to people of a foreign government / country. I would argue it has the effect of criminalizing dealings with foreign governments, unless the person jumps thru a bunch of administrative hoops. Plus, the way it is employed suggests it's mainly a political tool. As such, strict scrutiny should be applied to judge it's constitutionality.